Batman: Arkham Knight has been delayed several weeks from June 2 to June 23. 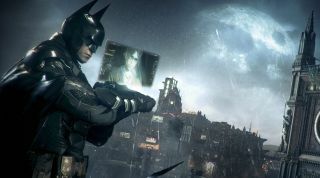 Presumably Rocksteady is lavishing some last-minute QA attention on that massive and ridiculously detailed open world. Or they're spending the time they need to really get those fancy Batmobile hub caps just right. The dev statement, via press release: "We're a developer that hates to make any compromises, so we are sorry to say this means it's going to be just a little bit longer until you can play the epic conclusion to the Arkham trilogy. As a reward for your patience and understanding, and to make the wait even more unbearable, we are pleased to whet your appetite with a new gameplay video of Batman: Arkham Knight. And here is that video, showing seven-or-so minutes of continuous Batman. Hey, it's Playstation 4 footage, but at least that means we can expect better framerates and better anti-aliasing on the PC version. I really hope there's an option to turn off motion blur. Big-budget games seem to be getting smudgier and smudgier.